Congratulations U14 Boys for winning 3rd place in ISSFHK Finals! U14 Boys did well and showed persistence and dedication. Well done! 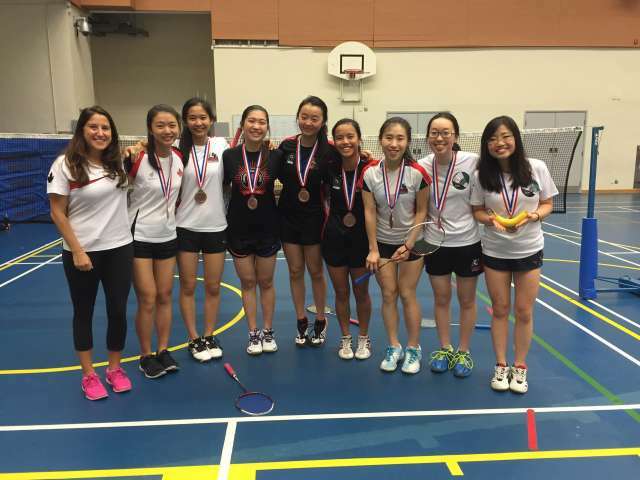 A big congratulations to our U-16 and U-20 girls badminton teams! Our defending champion U-16 girls rolled into the finals after beating the hosts, YCIS. But they met a formidable opponent in RCHK, and ended up earning a hard fought silver medal. The tradition of excellence continues for U-16 badminton. Well done girls! Our U-20 girls brought their swag and experience into the semi finals. While shaking off rust and bowing out to Harrow in the semi’s, the girls went into beast mode and took down VSA – a team they had previously lost to earlier in the season – for the bronze medal. A big shout out to K. Hui, Griddy Chai, Cece Chan, and Izzy Tse – our senior girls who played their last match for CDNIS. Thanks to Coach Kerbear Glazier for you dedication to the team all season. The U-16 baddy boys entered the semi finals as an under dog and short handed against RCHK. While meeting their match against the eventual champs, they re-grouped and swept their way to a bronze medal against the home crowd favourite, Harrow! Very well done, boys. Looking forward to seeing you back in full form next year. Our U-20 baddy boys, AKA the Redeem Team, confidently breezed into the semi finals undefeated. Their mission: gold or bust. After making quick work of AIS in the semis, the boys met HKIS in the final. Giving the boys a brief scare, Matt T. and Herman kept their cool and won a thriller to clinch the gold medal! Mad respect and recognition to our co-captains, Devlin Wong and Hank Yeung, and Herman “Canadian!” Wong, as they took their final curtain call as seniors. You boys will be missed.